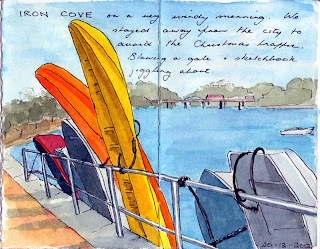 We had planned to go out sketching in the Botanic Gardens. But in the days leading up to Christmas, the traffic in inner Sydney is horrific and we needed to cross the city to go to the Gardens. We decided to move on to Plan B. 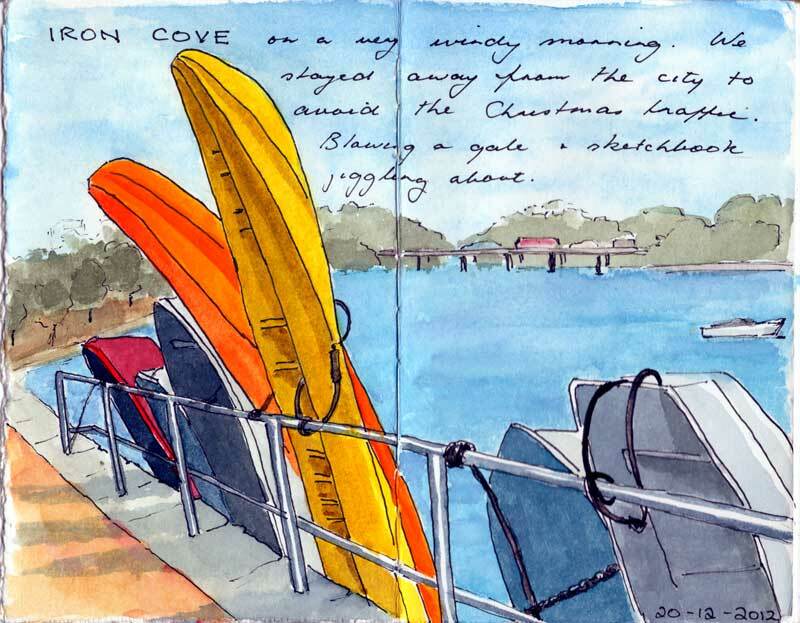 We went to Iron Cove, just down behind the Leichhardt Pool where I used to swim. They used to tie the boats up on a wooden jetty, but they have them tied to a railing now. Not so picturesque, but still interesting with all the colours. The sky was a bit cloudy and it was very hot. There was a strong wind, and we had to hold our sketchbooks firmly, and even so they occasionally did an inadvertent jiggle. That is why we drew in pencil and finished them at home. In fact the wind grew stronger and chased us away, so we went to Leichhardt (Italian area) for a coffee at the Locantro.